Pebnaw. To the left are some of the backrests of the Pebnaw chiefs. 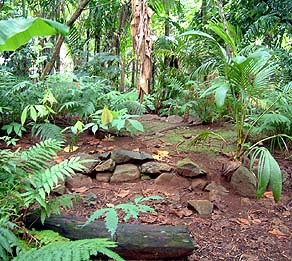 The large flat stone to the right is where the offerings brought from Falsew would be placed. “For a long time, the people of Ulithi and the Outer Islands used to come by canoe—a fleet of canoes." William Yaad explains the sites of Gachpar and their relationship to the sawey and the tribute trips. "They used to come from Chuuk, all the way down to Ulithi, bringing their offerings to Gachpar. The men from Pebnaw used to take all the offerings to the Men’s House in Gachpar. That Men’s House is called Falsew. That’s the name of the Men’s House. The meaning of this Falsew is the ‘number-one men’s house.’ Fal is Men’s House, sew means one, for number one. These are Ulithian words. And it’s number one for all the Outer Islands. "Gachpar has two sections, Ariap and Falang. Falsew is located in Falang section, which has a relationship to Outer Islands—to Mogmog in Ulithi Atoll." 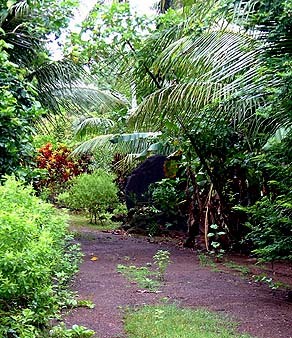 “When they come to Yap and stay, all of them stay at club houses along the sea shore. And the high chief of Mogmog would come to the high chief of Pebnaw, and together they would go to the Falsew Men’s House. And there he gives the offerings to the high priest of Gachpar, and to all the chiefs in the Men’s House. He would give this offering from their islands. “They would then take some of these offerings to, let’s say, the ‘House of Pebnaw’ and leave it there. And they had to hang it up for at least seven days, during which time they were not to eat fish and not to wear textiles or use the coconut oil on their hair. That is for this offering. It means that they are making themselves suffer, so the spirit will be good to them. Shoreline of Gachpar, as photographed by Cordy in 1982. Three of the stone backrests at Pebaw. "You give the offerings to the chief for the spirit of this place, so that the spirit will love the Outer-Islands people: will not give them a sickness or epidemic or typhoons, anything like that. And will bring in more fishes, more coconuts; more women to be pregnant, to be more people. "The Pebnaw council is about five or seven, all of them. This council, they used to live there and accept the offerings coming from the Men’s House, and to distribute them among themselves. This is after those seven days have passed. There are stone backrests for those people who are members of the Pebnaw council. "The Pebnaw Council is from Gachpar. It includes the Chief and High Priest. I’m not talking about a Catholic or a Christian high priest, but local High Priest. And all the rest of the Pebnaw council." Sites of Gachpar, based on maps by Descantes (1998) and Corty (1982). P'eebaey are public meeting houses; Falew are Men's Houses; Malal are stone-money "banks." William identifies the Ariap and Falang sections of the Village. Descantes says that the Galpagal section is the most recently added, and least important, forming a transition zone to Wanyan Village. “When they take the offerings from the Men’s House, Falsew, to Pebnaw, the place they used to put them was on that flat stone. The offerings would sit there for a while on that stone, and the Council would talk about them, and then they would distribute them. 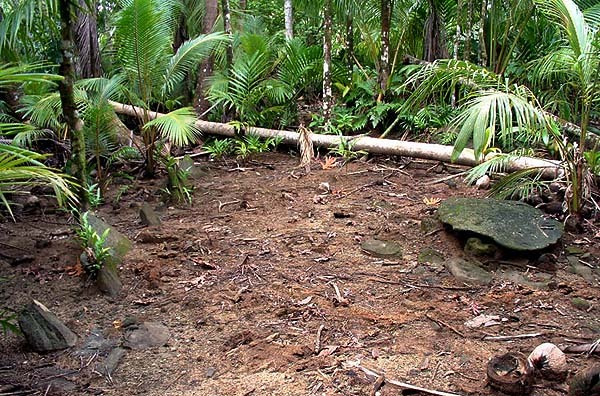 “That Pebnaw platform was also used for fishes from Maap and Ramung, two municipalities north of Gagil. When they catch fish, they bring them to Gachpar, and that flat stone, that’s where they used to put them. "There is still a Pebnaw council. I’m the one who used to distribute the things on the stone, flat stone. When we have, I’m the one. Not really High Chief but I’m one of the members. So one of those backrests is mine. And also in Falsew, I know which seat is mine." “When we all met in Falsew, only one of the Outer Islanders would come. Only the High Chief. The backrest of that Chief of Pebnaw would be facing the council. And the backrest of the High Chief from Mogmog was at his back, behind him and at a right angle to him. The Mogmog chief cannot face the Council of Gachpar, because he’s from the Outer Islands. He cannot talk to the council. Anything he wants to say, he talks to the Pebnaw Chief, who then talks to the council of Gachpar. 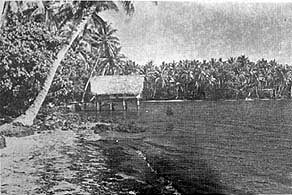 "While this is happening in the Falsew, the Outer Islanders would be staying at the club houses at the sea shore. There used to be all sorts of men’s houses along the seashore. One, two, three, four, five, six, seven in Gachpar. And were they for each of the different Outer Islands. The Ulithi chief and some of his company would stay in one. " 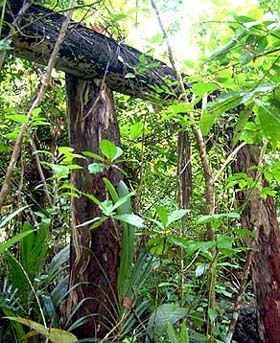 Posts remaining of the overgrown Falsew. The road connecting Falang to Ariap sections. 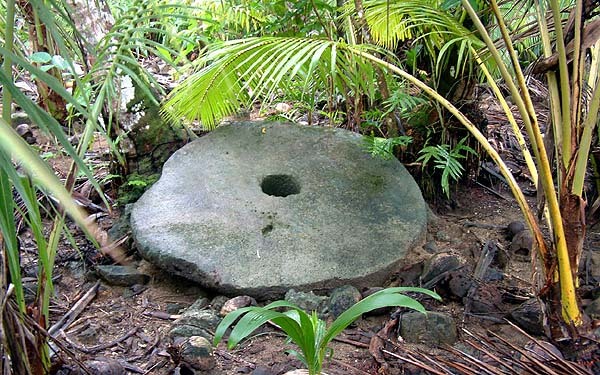 A large stone money piece marks the edge of the malal of the Ariap section. "This fleet of canoes coming to us was about ten total. And if eleven or twelve or thirteen, then there’s two come and stay in one sawey, because we count only ten. Six go to Gachpar, and four go to Wanyan village. We Gachpar people give only these four to the Wanyan people, the next village. "This sawey relationship between Gachpar and the Outer Islands, it’s not only Gachpar to Ulithi and that’s all. It’s Gachpar to Ulithi, Ulithi to Fais, and so on, and each one of them has their own site, when talking about the Pebnaw and Ethoew’ platforms." "Further down from Pebnaw is another Men’s House, Peegachpar, with the big stone money bank. This Men’s House has no relationship to the Outer Islands. Only to Yap proper." 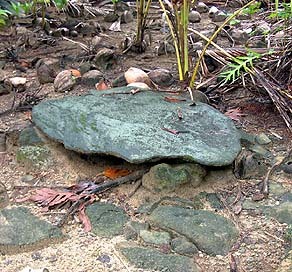 One of the few pieces of rai or "stone money" at the Pebnaw platform. "But the Ariap section is the ‘young men’ side, or the ‘active chief.’ So Falsew is the sitting chief, with a small stone money bank. The other one is active chief—he’s for Yap—and has big stone money bank." "Ethoew’ is another platform that was chosen for an ancient chief. He still has his voyage to the Outer Islands, but no place really to talk about like Pebnaw. He has his club house down at the seashore. The name of that clubhouse is Faltamol, ‘The chief’s clubhouse.’ Fal is a club house, and tamol is a chief, in Outer-Islands language. "So when the tribute comes in from the Outer Islands, most is taken to Pebnaw and some goes to Ethoew’. It all comes in to Falsew and then goes to Ethoew’ and also to Pebnaw. So it goes to Ethoew’ directly from the Men’s House, Falsew, not from Pebnaw to Ethoew’. 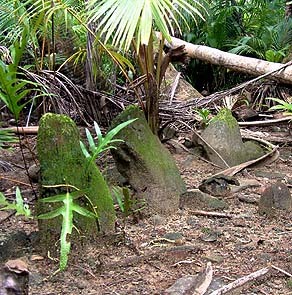 Remains of the platform of Ethoew'. Rock at Pebaw where the offerings were placed. "Ethoew’ is not like the Pebnaw, with a lot of voyages. There’s just one certain chief that sits at Ethoew’. And so when the tribute would come to Falsew, some would go to Ethoew’. And this Ethoew’ also has his own council. But the power of Pebnaw is bigger than Ethoew’. "This council is connected to Ulithi and all the way to Satawal. And we have two voyages going from Gachpar to the Outer Islands. One from Pebnaw and one from Ethoew’. Not only Pebnaw went to the Outer Islands, no. One from Pebnaw and one from Ethoew’. And so when the tribute comes in, it goes to Falsew first, and then their shares go to Pebnaw and also to Ethoew’." “The council of Pebnaw and the council of Ethoew’ are different. And they are both under the paramount chief of Bulwal, in Gachpar. He’s the paramount chief. Bulwul is a piece of land. And he’s one of the three paramount chiefs of the island of Yap. There is one in Gachpar, which is Bulwal; and one in Tamil which is Arib; and one in Rull, which is Ru’way [see map]. "These ranking villages—the three pillars—form after the Flood. 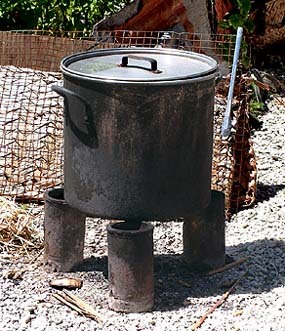 There was a pot in which they were boiling some kind of medicine to put on the Flood to make it recede. “These chiefs form the three stones we use, the three pillars for the pot. And there is a reason for these three pillars. If you have only one or two pillars and put the pot on, you lose the pot. So these three pillars, they divided them on the island: one to Gagil, one to Tamil, and one to Rull. They are holding the island of Yap. “Pebnaw and Ethoew’ are in the same village, same section, but under the chief of Bulwal. But there are two different councils. Ethoew’ is only for the Outer Islands. And Pebnaw is for the Outer Islands and Yap. That’s the difference. And then the next one is just for Yap." Three pillars holding a pot on Mogmog. The Peegachpar Men's House, in the Ariap section of Gachpar. The stone-money bank or malal, partially seen here, denotes the dance area. “The Peegachpar Men’s House has a big dance area in front of it. That’s for the local events from Yap. And that platform on the west side of the stone money bank, and every chief on the island has a backrest. “All the dancers used to come to Gachpar go to this section. No dancing there, in Falsew. Only one night they perform there. Only Outer Islanders dance there." "And it's not a dance really, they call it ganathog. I don’t know the meaning of this word. It’s an Outer Islands word. My father told me the name of this ganathog." Mariano suggests it comes from kall'adoh, meaning "look here" or "look at me." "And it’s not really a proper dance that they used to do it there," William continues. "On the last day for them to sail, each and every house platform on Gachpar must give a basket of food, about one foot long. Only two bananas inside—ripe bananas—and one piece of taro and one piece of copra. That food is not for them on the canoe. It is just to eat and carry the basket and make their decorations for their dance. "Or anybody who wants to take the basket, and put it on his head. He would stand up and start his dance. No two have a same dance. Each one will facing somewhere and dancing, any kind of dance he wants to do, wearing parts of the baskets. After that, they go on the canoe back to their place. That’s the only dance they used to do there." The dance area at Peegachpar. 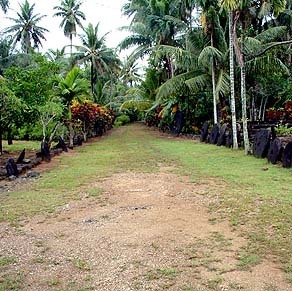 "How long the Outer Islanders stayed here depended on the weather. When they come they have their own navigator, looking at the clouds and everything. And when he says ‘let’s go,’ they go. Sometimes two weeks, sometimes it takes a month. It depends. But they usually come on the trade wind." Click here to see a map of the districts of Yap. Click here to read about the platform on the west side of the stone money bank, in the Ariap section. 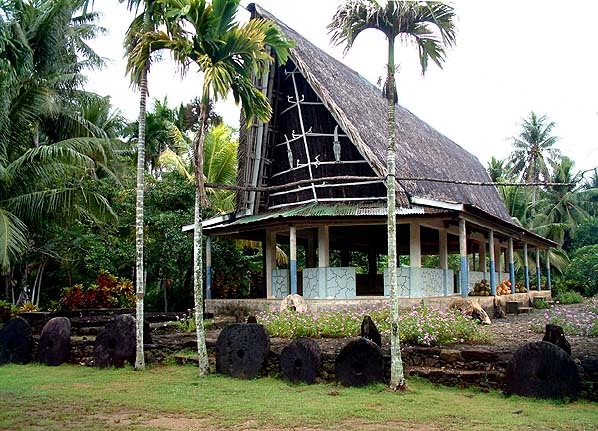 The traveling of Outer Islanders to Gachpar points out the close relationship between these cultures and the sea.